The coccyx is at the end of the spine and corresponds to the tail in animals, so it is often called the tailbone. It consists of three to five vertebrae. It is roughly triangular, with the tip of the triangle pointing down. The spinal cord goes down a hole inside each joint of the spine, with bunches of nerves leading off at each joint, but it doesn't go into the coccyx. 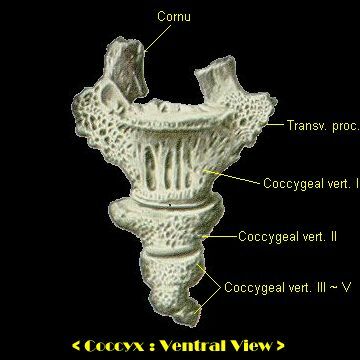 The vertebrae of the coccyx are just solid bone, with no hole down the middle. The pictures above are of the front and back of a coccyx. The rotating picture is a female pelvis, including the tops of the leg bones. 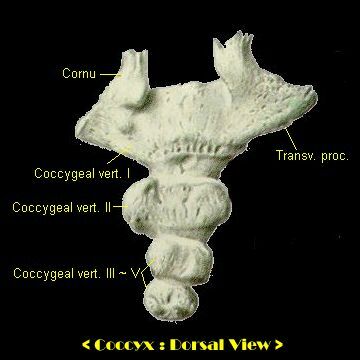 The coccyx is the small triangular bone hanging down at the bottom of the spine. Although it is padded with flesh, you can see it is quite vulnerable. But coccyxes vary as much as noses - yours may be twice the size as your neighbour's, or half the size, may be a different shape and may point a different way. Below is a picture of nine very different coccyxes. The coccyx is attached by ligaments to the base of the sacrum, which is the part of the spine that forms the back of the pelvis. 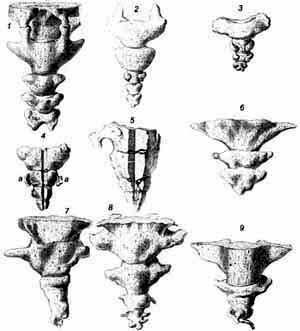 The sacrum consists of five vertebrae fused together. When the coccyx is surgically removed, these ligaments are cut. Cutting these ligaments and removing the coccyx does not affect mobility in any way. Afterwards, the ex-patient is able to do anything that a normal person does - run, jump, and so on. Although the coccyx is made up of up to five vertebrae, these may be fused together in groups or all together. Groups of fused vertebrae are called segments. Between the segments there are discs, as in the spine. Most medical books say that the vertebrae of the coccyx are almost always fused together in adults. This is untrue. X-ray studies by Postacchini and Massobrio have shown that less than 10% of the population have all the coccyx vertebrae fused into one segment. It is more common for it to be in two or three segments, sometimes more. The first segment may be fused to the sacrum. This study also showed that two thirds of people have a coccyx that curves down and slightly forward, and one third have a coccyx that points straight forward. Here are the detailed results of Postacchini and Massobrio's study. I haven't found any medical paper that says what range of coccyx sizes is found. From what people have told me, 3 to 10 centimetres (about 1 to 4 inches) seems the normal range. Very rarely, people are born either with no coccyx or with an actual tail. People with long coccyxes seem to be more likely to have coccyx pain. When you walk or bend over, the coccyx does not move much in relation to the spine. But when you sit down, this pushes the flesh of your bottom out of its normal position, making the coccyx move by up to 22 degrees. This has been shown by comparing X-rays of people sitting and standing.